Codeigniter describes itself as “a powerful PHP framework with a very small footprint, built for PHP coders who need a simple and elegant toolkit to create full-featured web applications.”. It also provides the underpinnings for Expression Engine and powers a lot of sites across the web. Derided by some due to it’s PHP roots it is, to my mind anyway, a brilliant way to go from idea to execution in a very short time. It also provides proper well documented avenues to extend it’s abilities. In my quest to make my life as simple as possible, and being from a non-programming background, I’ve always felt more at home with things where there’s a decent bit of documentation. Obviously, being a typical web geek, I rarely read the documentation wholesale but rather I dip into it as and when required. In fact much like we all fell for JQuery over Prototype I’d suggest that the documentation is one of the makes things that makes Codeigniter stand head and shoulders above it’s competitors. It’s also pretty small, very flexible and for non-programming types like me it’s all written on top of PHP which to my mind is the most accessible server side language on the web right now. Coupled with that the fact that it runs on just about any PHP environment with only a tiny bit of configuration and hopefully you are starting to see why I like it so much. Another important part of any framework choice (and again why JQuery leads the field in JS frameworks) is the size and strength of the community. Codeigniter has lots of places to find help from the very friendly message boards on the Codeigniter site, the Codeigniter Community on StackOverflow to following the tweets of people like Phil Sturgeon and (the far too talented for his age) Jamie Rumbelow. You’ll also need a rough understanding of the MVC (Model, View, Controller) pattern. Models describe the data structures within your system, views render that data, and controllers provide the logic to take that data and render it in views, as well as offering more in-depth functions. See the resources at the end of the article for more guidance on this. If you are happy with those then let’s get going! First up head over to http://codeigniter.com/ and download yourself a copy of Codeigniter. Normally I would recommend a cup of tea of coffee whilst you wait but as Codeigniter is only a paltry 2.2mb you’ll have barely left your seat by the time it’s done. The first thing Codeigniter does for you is map the URI to the controllers (you can overide the way it does this using the routes.php file in config but we’ll save that for another day) so, for example, http://localhost/account/ will call the index() function inside a controller named ‘account.php’, if you then created a function called login() inside the account controller you could access it by using the URI http://localhost/account/login/ . Any URI segments you pass beyond this will map as variables to your function eg:http://localhost/account/address/123 would pass the value 123 to an address function’s first variable eg: address($addressid). Open up the file named welcome.php in the /application/controllers folder and add this code which will run a simple echo command. Create a file called greeting.php in the /application/views folder, so we can begin separating our code out nicely, and put this code inside it. Now return to your welcome.php file in the /application/controllers/ folder and add the following after the end of the index function in order to call our view. So now we’ve seen a View and a Controller but we’ve not done anything with the Models yet. In Codeigniter it’s considered a standard to prefix all your Model files and class names with ‘M’ to make them easier to identify in the code eg MUsers, MProducts and so on. //create an array of "greetings"
It handles stuff like XSS Filtering (Cross-site Scripting Hacks) when used in conjunction with Codeigniters built-in Input class. That’s not to say this code is safe to stick straight on the web (any update form needs to be protected from unauthorised users) but it’d be pretty robust to simpler attacks. For more information see the Codeigniter user guide. 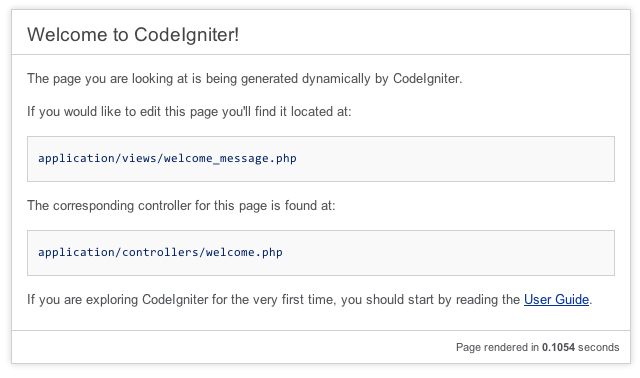 Codeigniter has a whole bunch of configuration you can do. Thankfully for code-phobics like myself you only need to play with a few files. Later you’ll want to get more involved with these (especially the routes.php file) but for our purposes we only need modify the file ‘database.php’ and the ‘config.php’ file. Handily the config items are all stored in the ‘application’ folder. The application folder should really be the only one that you ever need to play with, everything else is pretty much the Codeigniter core and version specific stuff. This also means if you need to upgrade just download the latest version and copy everything except the application folder over the top of your existing project. This can of course all be done using Git etc but as the last time I checked in a file in SVN it took my team a day to work out what I had done wrong I’m not going to instruct you on this! Next we’ll add an additional function in welcome.php controller to show off our wonderful data driven model. So what is the framework ACTUALLY doing for me? Ok, I haven’t given you much to go on here but we need to get some principles in place before we rush off to reinvent Twitter. Firstly by separating out the model and the view any time we ever need to get a greeting we can simply call $this->MGreetings->greeting($lang); rather than code it up hundreds of times across our app. This is often referred to as DRY: Don’t Repeat Yourself and is a worthwhile mantra in any coding pursuit. Codeigniter is also mapping the URI to our controllers and passing variables over. I’ve also not touched on helpers or libraries both those that are built into CodeIgniter and those you can either download from others or write yourself. A helper or a library is a discreet block of code that provides either a nice wrapper to hold related functionality or in other cases completely new functionality. Codeigniter has all these helpers and libraries* bundled and more: Array Helper, CAPTCHA Helper, Cookie Helper, Date Helper, Directory Helper, Download Helper, Email Helper, File Helper, Form Helper, Calendar Class, Cart Class, Email Class, Encryption Class, File Uploading Class, Form Validation Class, FTP Class, Image Manipulation Class, Input Class, and MANY, MANY more! Now we’re getting into helpers you’ll start to see the real power of using a framework. Need to build a form? Simple, call the form helper, drop a few lines of code and you are sorted. Doesn’t have HTML5 elements yet? No problem extend the helper easily to include them. You created a new greeting with a language code of "<?php echo $greeting->lang;?>" and text of "<?php echo $greeting->text;?>"
Give it a go and you should see the values being preserved when a validation error occurs. As I mentioned earlier the community around Codeigniter is amazing. Loads of libraries are available and they are rarely charged for, just remember to give back code if you find modifications that help or perhaps even write your own libraries and make them available. 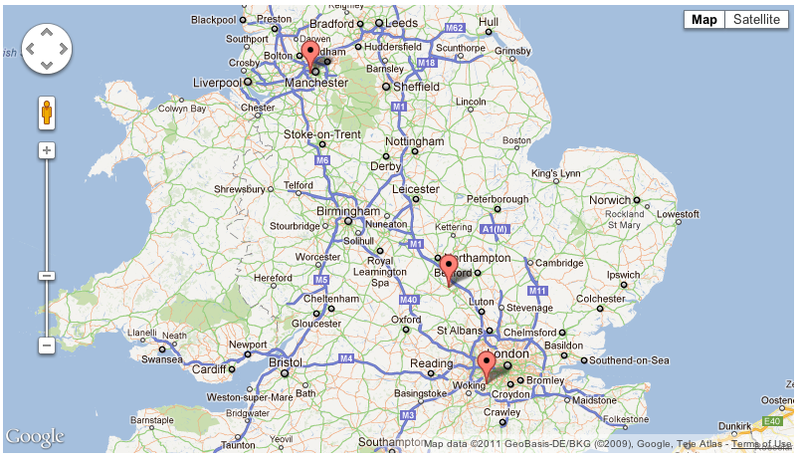 Without a shadow of doubt the best library for Google Maps is Steve Marks’ superb Google Maps Codeigniter library. It provides a great way of producing google maps on your pages including festures such as clustering, custom markers and so on. It also has a PDF full of documentation on all its features. So go ahead and download it from here. Create the locations() function in the Geekkarting Controller which will grab some data from the database and assign it to the GoogleMaps library. I’ve tried to gloss over it but it is one of the niggles of Codeigniter that it doesn’t ship with a decent .htaccess file to get rid of the index.php in the url. Being no expert on all things .htaccess I can merely point you to some guidance in the Codeigniter notes which I hope will fix things for you. When you discover something cool in Codeigniter give back to the community, let us hear about it too. 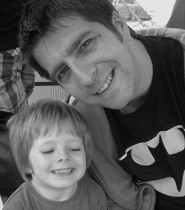 And finally, make sure you come along to a Geek Karting event in the future and say Hi! Although not incorrect, it’s not necessary to define a __construct() method when you define your MGreetings class, unless you intend to extend the behaviour of the CI_Model __construct() method. Just thought it should be pointed out.